I used to really enjoy mechanical tinkering as a younger man, particularly on bikes. Necessity being the Mother of Invention, I learned a lot of mechanical skills as I couldn’t afford to have my bikes or cars fixed by people who actually wanted paying! When I first came to LA, I was a motorcycle messenger for a couple of years while I “found my feet” (yes I’m legal here so no Guantanamo, thank you). These two years smashed any mechanical desire out of me. Long hours thrashing around the City, looking forward to a weekend, only having to spend that weekend cleaning carbs, servicing, changing tyres, etc., so I could go back out for another week of work. It made me want to throw my tool kit away forever. 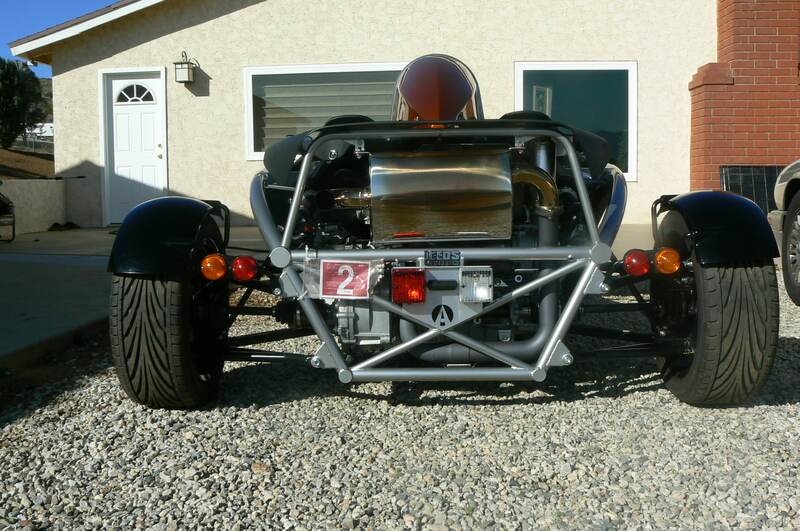 The Atom has begun to re-kindle those almost dead embers of interest in tinkering, however. Aside from the obvious beauty of the mechanical components of the Atom and the ability to see many mechanical components actually doing their jobs, there are significant advantages to the Atom in terms of being able to “do-it-myself”. There are also some significant downsides and foibles. This post will go through some of the issues that have arisen since I got the Atom and the plusses and minuses of the car in relation to them. The first issue I encountered was the day I first got her home. Basically, the clutch would not disengage and kept driving her. I had first hand seen that the lack of ground clearance was a massive issue and had to move my trailer to a “hump” to even get the Atom on to the trailer without crunching the tub. I got her home, found a hump, was trying to gingerly back up so as I could stop if the angle was wrong. At that point the clutch bit, I couldn’t disengage and she drove off the trailer. I honestly think that the only thing that stopped the tub crunching was the vacuum created by me clenching my bum! The upside of trying to sort this was that bleeding both ends of the clutch line is a piece of cake. The downside was that it didn’t cure the issue. It seemed that the slave cylinder might be the culprit. If that were the case it was a full “engine out” job with only 40 miles on her. Taking her back to Brammo was a non-starter and they helped me find a place familiar with the Atom locally – TLC. They had an endoscope that could see into the bell housing. By this time, there was a significant fluid leak. They found the pipe connecting the quick fit to the slave cylinder was not on properly – which they remedied. Alas, that’s not been the end of the clutch issue. Every once in a while, the clutch still refuses to disengage. As it’s no longer leaking fluid, it points to the master cylinder, which will be replaced this weekend. Never truly knowing where the clutch is going to bite is a bit of a mission on top of the actual driving. It also ruins the street cred when you lurch off at a light too! Next up, yet another fluid leak coming from exactly the same place. This time it wasn’t clutch fluid as I drew a line on the reservoir to see if I was losing any. I wasn’t and this was a significant leak. The upside of the Atom is that once the “tea tray” is removed, the motor is really easy to access. The downside of this problem was that I couldn’t tell what the fluid was, or see where it was coming from. I spotted a leak in one of the coolant lines, added a hose clamp and thought “sorted”. Wrong. I found an oil leak from the pan gasket. fixed that and thought “sorted”. Wrong. After pulling my hair out and nearly succumbing to the temptation of adding a dye to the oil, I eventually found another coolant leak right at the top of the motor. The problem had been that I had had in fact, three fluids leak and collect and drip from exactly the same point under the engine. Anyhow, she’s been dry as a bone since then – knock on wood! Next up! She blew 2 exhaust gaskets. One connecting the muffler to the “upspout” (my word) and one connecting headers to “downspout”. This happened on a Canyon run. While the sound of a Chieftan Tank on creatine did have some merits, I was pretty ticked off that the gaskets had only lasted 1000 miles. The downside – Brammo’s design of exhaust has flaws, particularly the “ram horn” headers that generate and trap a lot of heat. Not only does this reduce HP because of hot air being sucked in the supercharger, I’m sure it also caused the gaskets to fail. The upside – The Atom is stock in many ways. 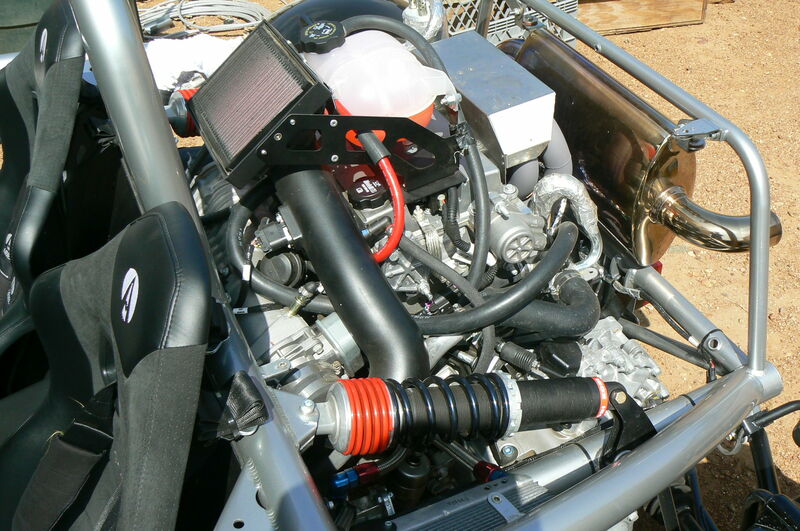 The Ecotec motor is standard issue Saturn plus supercharger, for example. I went to my local Auto store, $17.00 and 1/2 hour later, the gaskets were replaced and functional. I’m definitely going to replace the Brammo exhaust with an aftermarket system as funds and time allow as it’s inevitable the gaskets will blow again and I want to address the “hot air” issue too. Last but not least, the starter motor solenoid. Yep. 1200 miles it went. On the face of it an easy fix. Up on jacks and stands, the starter is right there. However, whoever designed the upper mounting bolt to be located where it is should be “punished” with the rough end of a rag man’s trumpet. An utter swine to get out, worse to put back. I think in fact that when the motor does come out for something, that bolt location will need to be helicoiled. $50 for the solenoid though and back on the road. So, all in all, a fair amount of niggles and un-necessaries. I was expecting foibles, but not really the ones I’ve had. The upside is that the Atom is relatively easy to work on, parts are not expensive for motor and drive train at least. I have been re-inspired to work on a vehicle. 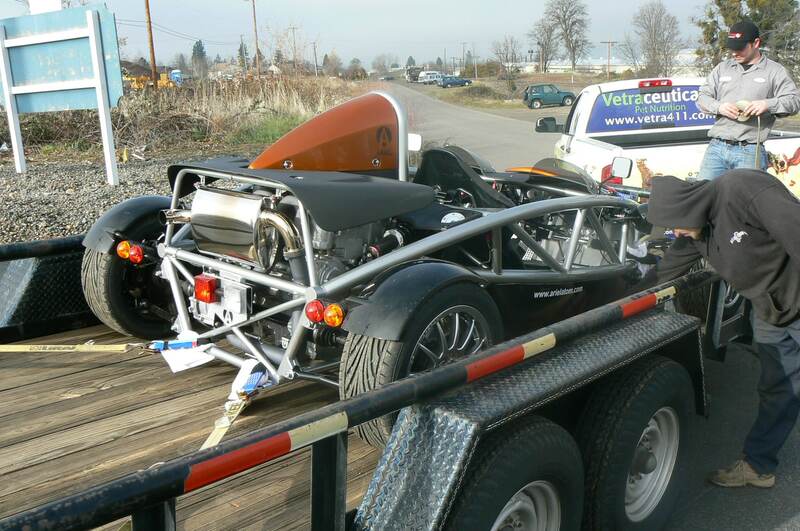 There are other Atom owners who have gone to town re-building theirs, in one case to make it 450HP! I’m not that inspired yet, but happy to do the work to keep her running so far and as I add the aftermarket improvements like the exhaust, maybe I’ll get the full bug that some owners have to constantly have her apart. For now, I hope the work that’s been done and the upcoming work will just allow me to drive the heck out of her for a few thousand miles! If I can do that, I’ll also be taking her to the track and am very much looking forward to tinkering on the set up of shocks and so on. Lots to learn there. Click on the image below if you’d like to find out more about how I get paid to own an Ariel Atom.